Sharjah-based Nabeel Perfumes, which ships 60 per cent of its output to overseas markets, has announced it is in the process of expanding its retail network within the UAE and abroad. The company recently refurbished its corporate headquarters at the Sharjah Airport Free Zone (Saif Zone) and hosted a visit from Saud Salim Al Mazrouei, director of Saif Zone and Hamriyah Free Zone Authority. Nabeel Perfumes has an installed capacity of more than 60 million units per year. Its chairman, Asghar Adam Ali Ibrahim, said the group is investing heavily in setting up retail centres and this year alone opened 33 stores in the UAE and the Gulf out of a total of 40 such spaces it operates. “We’re launching three to four outlets every month and the trend will continue until June of next year. We introduce 15 products every year and export nearly 60 per cent to international markets,” said Ashghar. Nabeel Perfumes has hubs in India, the UK, the US, Australia and all the Gulf countries to speed up deliveries. It has been manufacturing fragrances for 46 years and is one of the top makers of perfumes in the Middle East. Nabeel, meaning noble in Arabic, was founded in Yemen in 1969 by Asghar. It moved to the UAE in 1990. It manufactures Oriental and Occidental fragrances in the form of bakhoor (incense), oudh (agarwood) and ittar (fragrant oil), supplying to a global audience. They are marketed under the Premier, Elite, Heritage, Souq and Luxury collections. Nabeel also produces a French line of fragrances under the name of Chris Adams. The company bagged the 2013 Sharjah Economic Excellence Award (Silver) in the large establishments category. 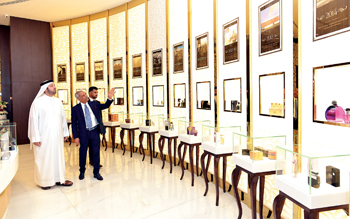 Al Mazrouei, taken on a tour of the company’s headquarters, congratulated Nabeel Perfumes on its expanded footprint and assured it his full support.